One of life’s greatest dilemmas is what does one do with all those empty liquor bottle lying around the house? No lie, a collection of bottles make for great decoration,especially if they vary in size and color. But, let’s take that a step further: why not make a lamp out of them? While this may sound like an idea one comes up while under the influence, but when done sober, can become a quirky, creative conversation piece. They are easy and relatively inexpensive to make.You could even go crazy and make a bunch of them and sell them for profit. 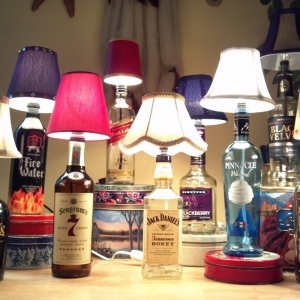 Here’s the instructions on how to make your own personalized lamp. Have fun!